When we get an unhealthy buildup of toxins in our body, it’s not pretty. These excess toxins will cause physical and mental health issues like chronic fatigue, achy joints, brain fog, headaches, insomnia and allergies. Perhaps you are already struggling with an auto-immune disease like ulcerative colitis or rheumatoid arthritis, maybe you take something for heartburn, acid reflux or migraines. These are all signs from your body that you need to cleanse. But, many of us think of a cleanse or a detox as pure deprivation! We think we will go hungry, be asked to drink weird juices, and even worse …have to do enemas! Let’s face it we can all do with a little less of the sweet stuff but even if you have never touched a teaspoon of the white crystals- you are probably taking in more sugar than you realize. Everything from white flours, pastas, breads, sauces and even drinks are loaded with sugar. All processed foods and packaged foods are sweet. In fact, sugar is the new opiate. Did you know that sugar has been proven to be more addictive than cocaine? No wonder ‘just saying no’ does not work. A cleanse will help release you of these addictive food cravings so that you never have to worry about a food addiction again. Do you ever feel that life is just too much – from the time you get up to the time you go to bed; you are in ‘go’ mode. When was the last time you read a novel, went for a leisurely walk in nature, enjoyed a hobby for hours, or just sat and contemplated your navel? We live at a roadrunners pace that has us ultimately dealing with insomnia, a lack of exercise and no time for ourselves. The best way to reset your life is by taking some time to eat simple and nutritious foods, to add some nurturing self-care routines, to get good quality sleep and exercise to move toxins out of our bodies. A combination approach like this will have you feeling vibrant again with sustained energy to do all the things you want to do. We live in a sedentary culture that has us sitting for most of the day. We sit at our desks all day, sit in the car going home for work, sit and watch TV at night and then go to bed. It is hard to find the time to exercise, yet movement is one of the best tools for moving toxins out of the body. When we move, we increase the movement of the lymphatic system – digestive system and the circulatory system. These are the systems responsible for the movement of waste out of the body. A weakened digestive system, a poor circulatory system and a sluggish elimination means you are building toxins and creating inflammation. Now I am not suggesting you suddenly join a cross fit gym, or run a marathon. But even some gentle stretching will help. I am constantly surprised by how many people talk to me of gluten sensitivity corn sensitivity, problems with eggs, dairy, and soy. What is going on that we suddenly cannot eat these foods. Have we all developed a sensitivity to gluten? It certainly looks like it when we see the grocery stores laden with gluten free products. I would argue that it is not the food that is the problem, it is that our digestive systems have weakened to the point that we can no longer digest these more difficult to digest foods. Food sensitivities are really no different to other chemical exposures – we become super sensitized to these foods that create an immune response. So rather than just removing the foods and hoping that solves the problem, lets deal with the problem at its source and get the digestive system functioning really well. 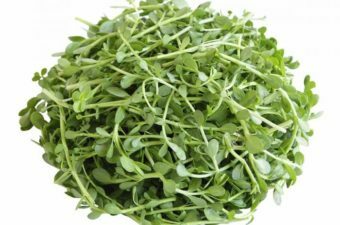 If you want to cleanse and lose weight sustainably, or you want to end food addictions and get rid of cravings and sensitivities. If you are just tired of feeling tired and want to feel full of vitality again – you can. 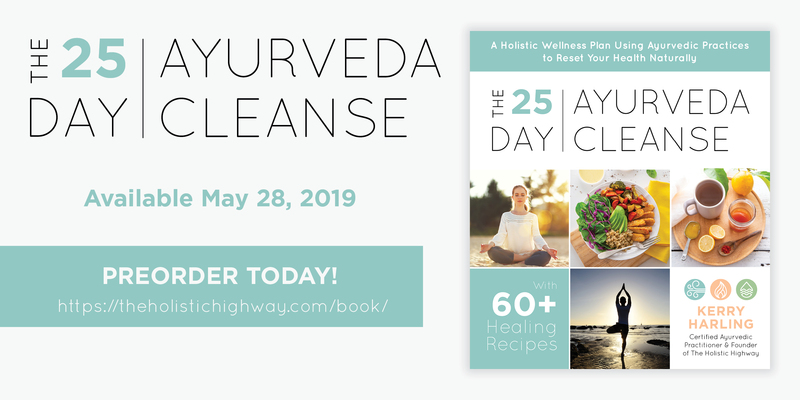 Check out my new book The 25-Day Ayurveda Cleanse. Publication date is May 28th and pre-orders are available now. 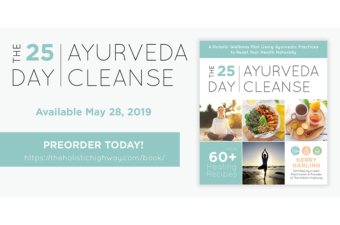 In this book I will teach you how to transform yourself and kick unhealthy habits to the curb once and for all with a cleanse based on the ancient wisdom of Ayurveda. Using food as medicine, I will help you get to the root causes of ill health and bring your body, mind and spirit into balance. 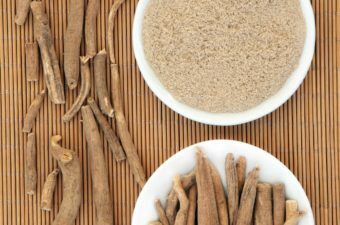 Ayurveda works because it’s not a diet; it’s a holistic approach to living that’s tailored to your “dosha,” or unique metabolic type. How do you get to feeling great again? This book will gently guide you back to health and happiness.